I am an art freak, I love music, I love poetry, I love movies, theatre, and all the beautiful things that add up to art. I think everybody adores art and without it life is hollow. While some people create art, some people themselves are art. They say, through action a man becomes a hero. Through death, a hero becomes a legend. Through time, a legend becomes a myth. And through hearing a myth, a man takes action. This article is about Curse of the 27, a phrase referring to popular musicians, artists, or actors who died at age 27 and became legends. This is not just an article; it is a tribute to artists whose legacy goes on till date. Curse of the 27, Club 27 or Forever 27, is categorized as a myth. But the death of the likes of Jim Morrison, Kurt Cobain, Amy Winehouse, Jimi Hendri and many other artists at the age of 27 made this a legendry club. 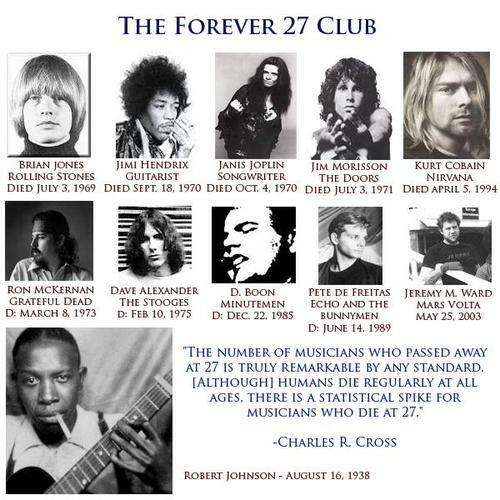 The Club 27 remains a cultural meme for art and music lovers, documenting the deaths of celebrities, some noted for their high-risk lifestyles. Names are often put forward for inclusion, but because the club is entirely notional, there is no official membership. The death of these popular personalities was often as a result of drug and alcohol abuse, or violent means such as homicide or suicide. The deaths of several 27 year-old popular musicians between 1969 and 1971 led to the belief that deaths are more common at this age. However, statistical studies have failed to find any unusual pattern of musician deaths at this age. Brian Jones was an English musician, known as the founder and the original leader of the Rolling Stones. He founded the band in 1962; Jones played a wide variety of instruments on Rolling Stones recordings and in concerts. However, Jones did not get along with the band's manager, Andrew Loog Oldham, who pushed the band into a musical direction at odds with Jones' blues background. At the same time, Jones developed alcohol and drugs problems, and his performance in the studio became increasingly unreliable, leading to a diminished role within the band he had founded. The Rolling Stones asked Jones to leave in June 1969 and guitarist Mick Taylor took his place in the group. Jones died less than a month later by drowning in the swimming pool at his home while under the influence of alcohol and drugs. He was aged 27. After Jones, American rock guitarist, singer, and songwriter, Jimi Hendrix died in 1970, aged 27. He was followed by singer, songwriter and poet, Jim Morrison who died unexpectedly at the age of 27 in Paris, the cause of Morrison's death remains unknown. The idea of a "the 27 Club" began to catch on in public perception when the musical band Nirvana's front man Kurt Cobain shot himself in 1994. He was also aged 27. 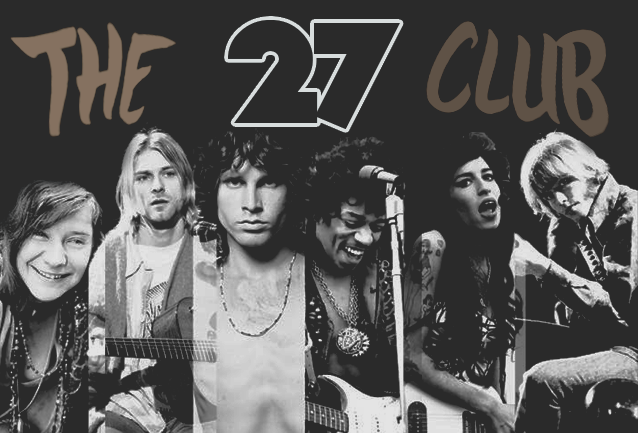 Not all members who joined the 27 Club were musicians; some were athletes and actors as well. Rolling Stone included television actor Jonathan Brandis, who committed suicide in 2003, in a list of "members" of the 27 Club. There are more than 40 artists who have succumbed to the, ‘Curse of the 27’ and although this remains a myth for some, but for some music lovers like me, this is a memory, a memory worth a graffiti on my wall.